If you have ever asked yourself, “What makes me feel most fulfilled?” you are not alone. Nearly 2 million people recently answered that question in a new survey by Abbott, the global healthcare company. 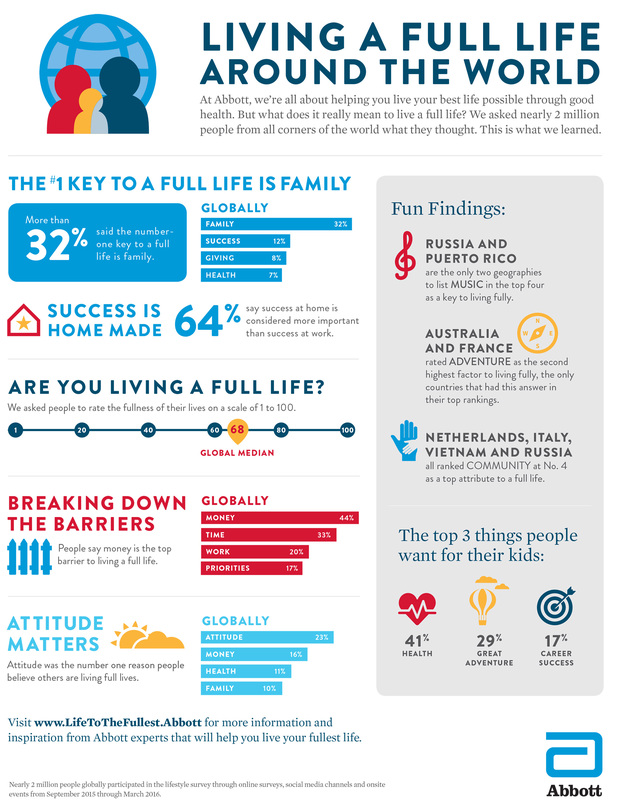 The goal of the survey was to understand what living fully means to different people and spark a conversation about happiness, health and human potential. The survey revealed several universal truths, such as family is key to a full life and money and time are the biggest barriers. 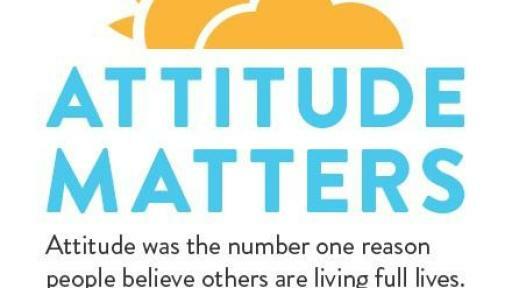 The survey also highlighted the importance of attitude. Respondents said it was the No. 1 reason why they believed others live fully. What is the one thing that makes you feel the most fulfilled? On a scale of 1 to 100, with 1 being “not at all living fully” and 100 being “living fully,” how would you rate yourself? Think of a person who you believe is living fully. Why do you think they live life so well? What keeps you from living your life fully? More than 32 percent of respondents said the No. 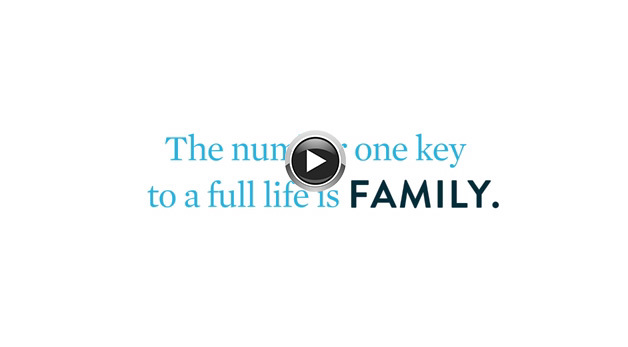 1 key to a full life is FAMILY, followed by SUCCESS (12%); GIVING (8%) and HEALTH (7%). Twenty-three percent of respondents said that ATTITUDE matters, and is the No. 1 reason people believe others are living full lives. Other key drivers were MONEY (16%), HEALTH (11%) and FAMILY (10%). People said MONEY (44%) is the top barrier to living a full life, followed by TIME (33%), WORK (20%) and PRIORITIES (17%). On a scale from 1 – 100 rating how fulfilled we are, the overall global median was 68. When asked what they wished for their kids, more than 40 percent of people surveyed said they want GOOD HEALTH (41%), followed by GREAT ADVENTURE (29%) and CAREER SUCCESS (17%). People who chose FAMILY or SPIRITUALITY as reasons why they are most fulfilled often rated themselves higher on how well they are currently “living fully.” People who chose SUCCESS or MUSIC rated themselves lower on the fulfillment scale. According to the survey results, the top 10 most fulfilled countries were China (79.2), Costa Rica (77.9), Colombia (76.2), Mexico (74.8), Indonesia (74.3), Thailand (72.9), Peru (72.3), Germany (71.7), Philippines (71.6) and Malaysia (69.1). 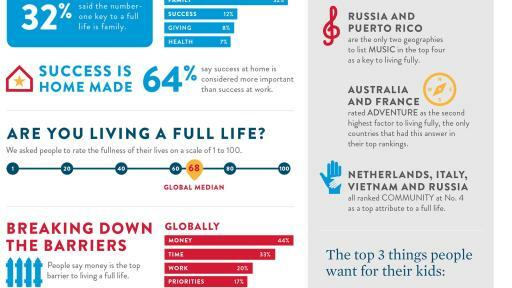 The U.S. came in at 65 on the scale of living fulfilled, just a few points under the global median of 68. HEALTH was listed as a top three reason why people believe others are living a full life. India, Philippines, Costa Rica, Puerto Rico, Peru, Argentina and France rated FAMILY as No. 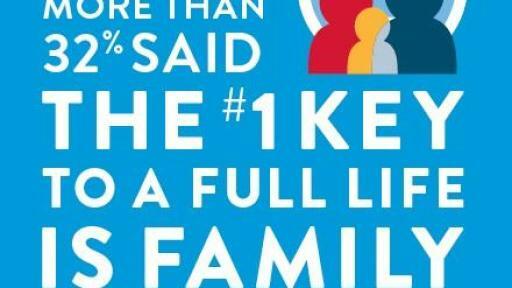 1 to living fully, but those same countries also said FAMILY was a major barrier. AGE and GENDER were not seen as barriers to living a full live in most countries surveyed. Russia and Puerto Rico are the only two geographies to list MUSIC as a key to living fully. Netherlands, Italy, Vietnam and Russia all ranked COMMUNITY at No. 4 as a top attribute to a full life. Australia and France rated ADVENTURE as the second highest factor to living fully. They were the only two countries that had this answer in their top rankings. 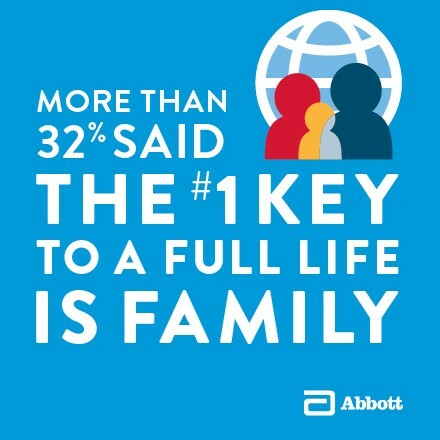 Inspired by these global insights and as part of Abbott’s effort to encourage others to live life fully, the global healthcare company is developing a series of tips/hacks that will help overcome some of the barriers uncovered in the global survey. These hacks will be simple, cost-effective ways to bring people together to make healthier choices, amp up their physical activity and live their best life. The tips will be backed by Abbott expert insights, science and “real world” road-testing from families worldwide. Throughout 2016, Abbott will share these simple hacks on Twitter via @AbbottGlobal and on Facebook at www.facebook.com/Abbott. You also can share your own hacks with #fullosophy. To learn more about the global study and to get more inspiration and ideas, visit www.LifetotheFullest.abbott. Why is living fully important? 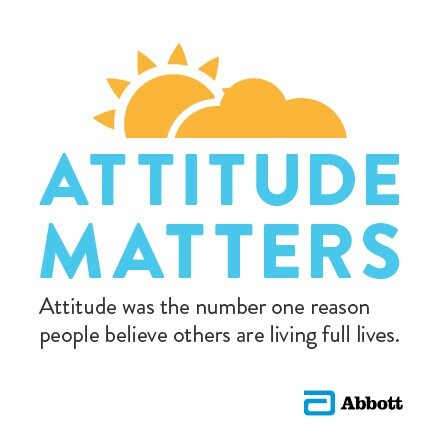 It can be summed up by Abbott’s mission, helping people live the best and fullest lives they can, through better health – LIFE. TO THE FULLEST. The goal of the survey was to understand what fulfillment means around the world and spark conversation about this topic. Nearly 2 million people globally participated through online surveys, social media channels and onsite events from September 2015 through March 2016. More of the global data summary can be found here. At Abbott, we’re committed to helping you live your best possible life through the power of health. For more than 125 years, we’ve brought new products and technologies to the world – in nutrition, diagnostics, medical devices and branded generic pharmaceuticals – that create more possibilities for more people at all stages of life. Today, 74,000 of us are working to help people live not just longer, but better, in the more than 150 countries we serve. Visit www.LifetotheFullest.abbott to learn more. Connect with us at www.abbott.com, on Facebook at www.facebook.com/Abbott and on Twitter @AbbottNews and @AbbottGlobal.